We're back once again for another busy weekend in the British Wrestling. This week we are heading off to HOPE Wrestling in Mansfield then travelling over to Leicester for Leicester Championship Wrestling before finally heading to Glasgow for Insane Championship Wrestling. Once again, let's get Ready For The Weekend! Firstly on Friday night, HOPE Wrestling host their first of three shows this weekend, this event taking place in Mansfield at the Forest Town Arena. The main event of the evening shall see Jack Jester defending the HOPE Championship against fan favourite, Martin Kirby. Jester has had a lengthy reign since becoming the inaugural champion back in July last year, Kirby is without doubt one of the most talented wrestlers in Europe so this could be the biggest challenge that Jester has faced in the last 9 months. The winner of the main event will immediately have to set their sights on the next challenge as the number one contender to the HOPE Championship will also be determined this Friday when CJ Banks, Pete Dunne, Joseph Conners and Jake McCluskey compete in a fatal four-way match. All four men would be a worthy challenger for the HOPE Championship so it really will come down to the man who capitalises on the opportunities presented to them and also their own skill and talent to walk away the number one contender. Friday will also see a rematch from last weekend's event as Chris Tyler shall once again face El Ligero. Their meeting last weekend ended in controversy as Tyler won via disqualification after Ligero accidentally struck the referee. Ligero's anger at the decision resulted in the official being on the receiving end of an attack from Ligero, something not often seen from 'The Mexican Sensation'. HOPE Wrestling have therefore scheduled this match between the two in an attempt to rectify the controversy. 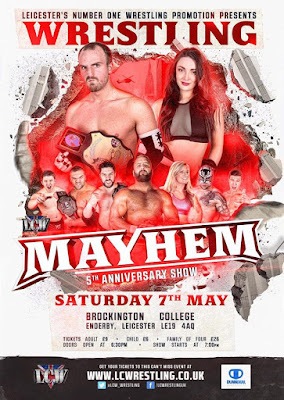 Moving on to Saturday and Leicester Championship Wrestling are at their usual haunt of Brockington College with 'Mayhem'. The event will see every championship defended. The Hunter Brothers have been chasing the LCW Tag Team Championship for a number of months. The current champions, DNA's Cy Gregory and Marc Massa have managed to hold back the challenge so far but this time the challenge will be even greater. This time they shall be defending the LCW Tag Team Championship in a ladder match. As Hunter Brothers quest to win has not waned, the inclusion of ladders may be the catalyst to propel them to another championship reign. Also on the line will be the LCW Young Guns Championship which is going to be defended in a fatal four-way match. The champion; TK Hayward will defend against Paul Malen, White Tiger & Alex Gracie. A fatal four-way match is a difficult enough task for a champion but this one will be even harder as all three challengers are or have been a champion within LCW. If Hayward can walk away still as a champion, he'll have gone further than he's ever gone before to do so. The main event this Saturday in Enderby will see 'The Man For All Seasons' Xander Cooper defend the LCW Heavyweight Championship against former champion, 'The Heavyweight House Of Pain' Stixx. After interference in previous encounters, it has been announced that this match shall be a first for LCW, a Lumberjack match. While Cooper will have his DNA members present during the match, Stixx shall also have back up in selected allies as he attempts to dethrone Cooper and once again become the LCW Heavyweight Champion. Finally the weekend finishes with Insane Championship Wrestling tape another edition of 'Friday Night Fight Club' in Glasgow at The Garage. This edition of 'Friday Night Fight Club' could well be the biggest yet as there is a lot on the line on May 8th. Firstly, Joe Coffey shall be facing Jack Jester with the stipulation that if Joe Coffey wins he'll receive an ICW World Heavyweight Championship match at Shug's Hoose Party III on July 31st. However a loss for Coffey will result in him quitting Insane Championship Wrestling. Coffey needs to go through a former champion to get a championship match or it shall indeed be the end of his time at ICW. 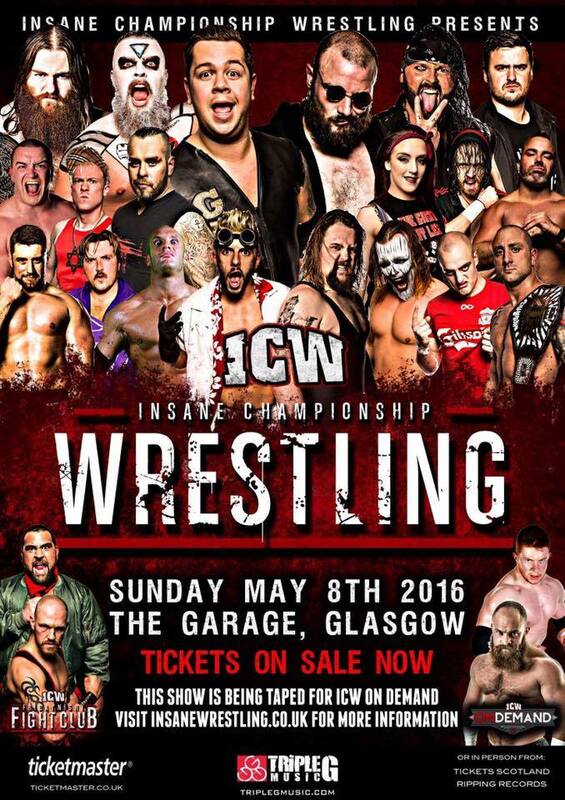 This Sunday shall also see the start of the ICW Tag Team Championship tournament. May 8th shall see two quarter-final matches take place as The 55's Kid Fite and Sha Samuels will face Alexander Henry and Jason Prime of The New Nation while The Rich Kids Of Instagram competing against Davey Boy and Joe Hendry of The Local Fire. All four teams will be looking to make their intentions clear right from the start and show others they are in it to win it. Sunday will also see a new number one contender to the ICW World Heavyweight Championship decided as Chris Renfrew faces Grado. Both these men have been champion before. Indeed it was Renfrew who ended the reign of Grado earlier this year so there is prior conflict between these two men. However, while the winner will be named the number one contender, the loser will not only record a loss, they will never challenge for the ICW World Heavyweight Championship ever again. While the reward for the winner will be great, the repercussions for the loser will alter their entire future in ICW.